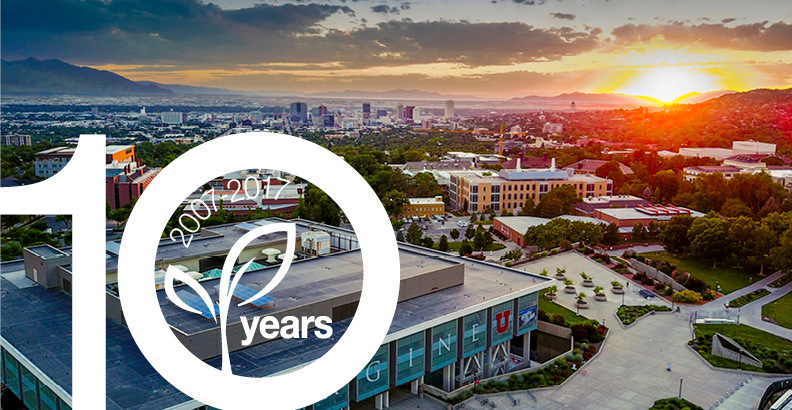 The University of Utah Sustainability Office turns 10 years old this year, and it is truly amazing to look around campus and realize how much has changed for the better in the past decade. Nowadays, there are campus vegetable gardens with ripe tomatoes and hives of buzzing bees, solar parking canopies that provide both power and shade, electric vehicles plugged into charging stations, crowds of students arriving on TRAX light-rail trains, tasty vegetarian and vegan options on offer at the cafeteria, water bottle refilling stations in most buildings, and plenty of recycling bins to divert waste from the landfill. The curriculum has changed, too. Undergraduates can earn a number of sustainability-focused degrees and minors, while graduate students in any field can add an Interdisciplinary Graduate Certificate in Sustainability to their credentials. Over the years, students, staff and faculty have all contributed to a vision of making the University of Utah a better place. In September, the Sustainability Office will celebrate these milestones and achievements with a Sustainability Showcase highlighting current programs and resources, and a special presentation by Dr. Vandana Shiva who advocates for traditional agriculture, and environmental and social justice issues worldwide. Join us at the Sustainability Showcase on Friday, Sept. 29, 11 a.m.-2 p.m. on the Marriott Library Plaza for food, live music and fun activities. Later this fall, Dr. Vandana Shiva will present a public lecture at Libby Gardner Concert Hall on Saturday, Oct. 20, 7:30 p.m., as part of UtahPresents 2017-18 season. Tickets are available now. Ten years ago, the transition to campus sustainability had barely begun, although a few major milestones laid the foundation. The first big sustainable change was a side effect of trying to cope with limited parking; in 1991, Commuter Services launched the Ed Pass program to give a UTA transit pass to every student and employee on campus. Not only did this encourage people to leave their cars at home, it helped expand Salt Lake City’s light rail network when enthusiastic transit riders from the U showed up at City Council meetings to press for construction of the Red Line TRAX, which opened in 2001. In 1996, a biology professor named Fred Montague started an “unofficial” campus vegetable garden to teach students about his ideas for ecological gardening. That unofficial garden became the foundation of today’s Edible Campus Gardens, which teaches volunteers how to grow food, supports organic gardening curriculum and sells produce at the University of Utah Farmers Market. By 2006, the university had also constructed the Spencer F. and Cleone P. Eccles Health Sciences Education Building, the first LEED-certified building which incorporated efficient use of energy and water, waste reduction and consideration of human health in the building’s design, construction, operations and maintenance. These efforts were significant, but they weren’t yet part of a unified drive to implement sustainability on campus. Divergent efforts began to coalesce in 2007, with the formation of the Sustainability Office (then called the Sustainability Resource Center), underneath Facilities Management. Something like the Sustainability Office doesn’t happen without visionaries. The idea was originally proposed by students, but it was City & Metropolitan Planning faculty member Craig B. Forster who led the effort to make the idea work. Forster, who became the first director, was a natural fit with sustainability. He was interested in facilitating interdisciplinary research and bridging the gaps between science and public policy. He also had a talent for bringing people together and was deeply involved with the local community. In the summertime, he was often seen at the Pioneer Park farmers’ market playing cimbalom (a kind of hammered dulcimer) with his Hungarian Táncház band. With only one full-time staff member and some volunteers, the Sustainability Office got to work organizing recycling at football games, installing the first solar panels on campus, setting up a campus farmers’ market, making sure that sustainability was included in the Campus Master Plan and developing a student fee to support student-led sustainability projects through the Sustainable Campus Initiative Fund. On Earth Day 2008, University of Utah President Michael K. Young signed the American College & University President’s Climate Commitment, dedicating the university to achieving carbon neutrality by 2050. The year ended in tragedy, though, when Forster died in a hiking accident. Despite the loss of Forster, the university persevered with a vision for making sustainability integral to its operations. In 2009, after a competitive nationwide search, architect and planner Myron Willson was appointed the next director of the office. In 2014, the Sustainability Office made another big change to adapt to the growing campus. Originally, the office was on the organizational chart under Facilities Management with the idea that university employees would take care of recycling, xeriscaping, transit passes and such. But then an interesting thing happened. Students were getting more and more interested in sustainable change. They wanted to try out their ideas, and the campus was the most natural place for them to do so. With the Sustainable Campus Initiative Fund (SCIF) now up and running, grants were available for student-led sustainability projects. The university had become a living laboratory for sustainable change, and sustainability-focused courses had popped up in academic departments all over campus. With so much involvement in interdisciplinary research and learning, the Sustainability Office moved into Academic Affairs, and Associate Vice President for Faculty and law professor Amy Wildermuth was named Chief Sustainability Officer in 2014. Wildermuth added Adrienne Cachelin, Environmental & Sustainability Studies faculty to the team as the director of sustainability education to guide burgeoning sustainability education efforts across campus. Under Wildermuth, the Sustainability Office also joined forces with the Global Change and Sustainability Center (GCSC), founded in 2010 by biology professor Jim Ehleringer to foster interdisciplinary sustainability research. Nowadays, under Director Brenda Bowen, Geology & Geophysics faculty, the 129 faculty affiliates of the GCSC represent nine colleges. The center supports graduate students through grants and fellowships, offers an interdisciplinary research seminar series, faculty networking opportunities, assistance for large interdisciplinary grants and core courses in the Interdisciplinary Graduate Certificate in Sustainability curriculum. Today, the Sustainability Office team includes fourteen faculty and staff members as well as numerous student interns and volunteers and continues to expands its scope. Though much progress has been made, sustainability is an ongoing effort, and there is still a lot of work to do. This year, the Sustainability Office celebrates 10 years of dedicated efforts of faculty, staff and students from across campus. The next 10 years of sustainability at the university will be guided by those in our community who get and remain involved. We invite you to be part of this important work. Join us at one of our fall events to learn about ways you can help make the U a better place for all who live, work and play here.